The raid was carried out in the Newcastle area yesterday. GARDAI HAVE SEIZED over €1.6 million worth of cannabis in a raid on a premises in west Dublin. Officers from the Garda National Drugs & Organised Crime Bureau assisted by the Special Crime Task Force investigating serious organised criminal activity carried out a search in an industrial unit in Newcastle, west Dublin, yesterday. Gardaí said that the investigation is ongoing. 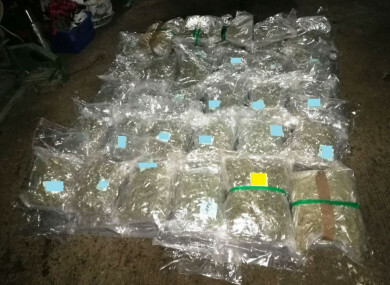 Email “Man arrested after gardaí seized €1.6 million of cannabis in west Dublin”. Feedback on “Man arrested after gardaí seized €1.6 million of cannabis in west Dublin”.